Click here for list of Candidatese. ✔ Search the recruitment option. 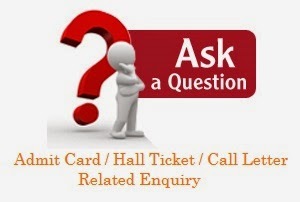 ✔ Then choose the option of admit card or Call letter. ✔ Fill the details which is required the admit card section. ✔ Your Duplicate Admit card will be seen in your computer screen. ✔ Take a printout of ... Admit card for the entering in exam hall.